I spent a fun afternoon sketching with Urban Sketchers at Architectural Antiques in the northeast Minneapolis art district. This building, a giant ware house or something, housed a zillion antiques. Everywhere you looked were interesting and old gadgets, furniture, lamps, lights, hardware, and tons of household items. I sketched an antique stained glass window and iron chair, and an old traffic light that caught my attention when I arrived. Such fun. I meandered into a large shop room full of handles, door knobs, and other smaller objects. The exit signs caught my attention, piled on a flat dolly, ready to be stacked somewhere. Where, I wondered, does one find these items? I had fun sketching a globe (looks like the one I had growing up), and a candelabra. The workers were very nice and let us sit and sketch whatever we wanted. It was almost overwhelming, there was so much for the eye to see. One sketcher remarked that the place put them in “acquisition mode” instead of sketching mode. 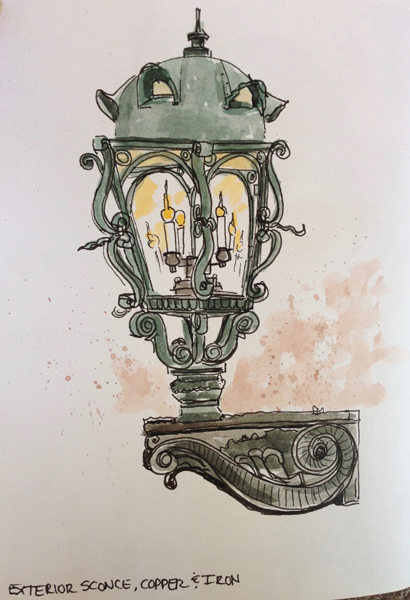 My final sketch was of an antique outdoor sconce. I liked its ornate shape and the fake candles burning brightly. The weathered copper added a nice touch. All in all, a great afternoon of sketching!